As I use the application only by myself I want to allow anonymous access to my application. If multiple users access your system you have to implement “proper” authentication in your application though. For the sake of simplicity I do not care about encrypting keys stored on my disk. However, if you use the code from this post in a real production system with multiple users please do yourself a favor and ensure any keys are stored as secure as possible. As this is yet another REST API, there is no need for a special library and a new API. If I use Spring already I can achieve the same result by simply using Spring’s RestTemplate. I just wanted to create, update and delete all-day events with an event title. There is no need for a full blown API that allows all options such as support for recurring events, multiple participants or reminders. 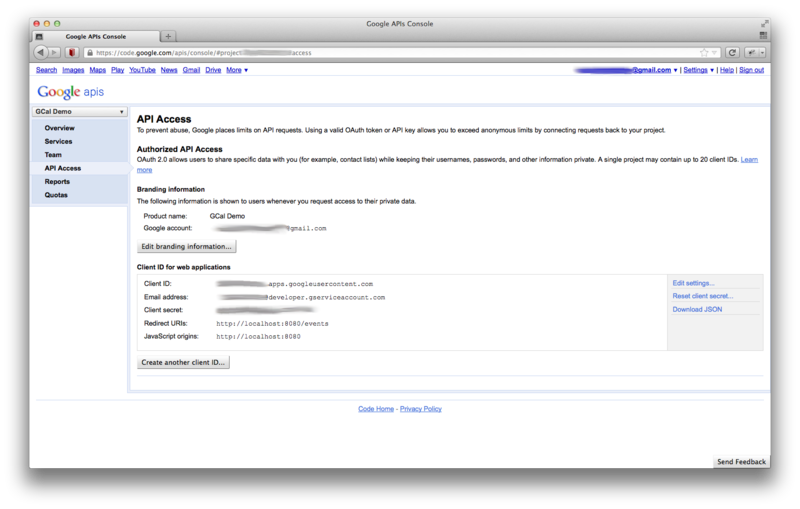 Prior to accessing a Google API an application needs authorization from users to access their data which is handled by OAuth 2. As the application already uses Spring for various aspects, Spring Security OAuth 2 was the obvious choice for me as it integrates nicely into the rest of the application. However, I faced two challenges: First, I needed to integrate Wicket and Spring Security OAuth 2 and second, Spring Security OAuth 2 needed some tweaks to work together with my setup. 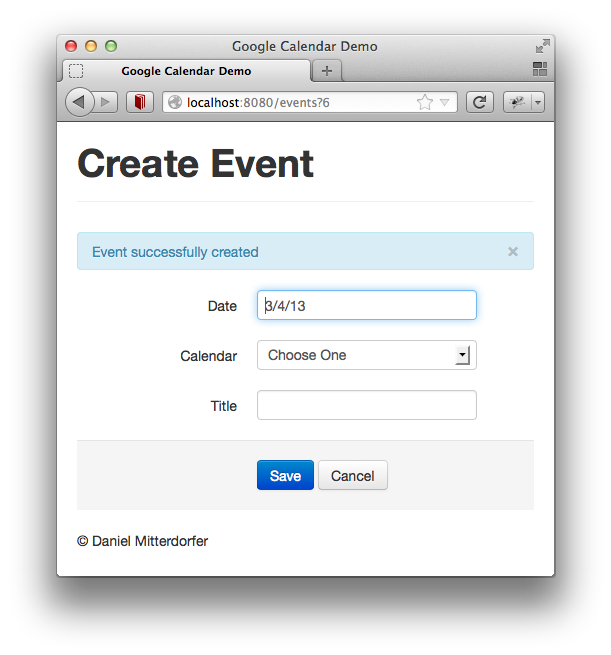 I have created a simple demo application which allows you to create an all-day event on any of your calendars. It is available on Github. Using OAuth 2 users can grant your application access to their data available through third-party services without providing you the credentials of the accounts you want to access. It involves three parties: Your users, your application (OAuth 2 client) and the authorization provider (OAuth 2 server). Apart from being users of your application they are also known to the authorization provider. When users access your application (step 1), it requests permission to e.g. access their data from a third party service (step 2). The authorization provider redirects to a page where users can grant your application access (step 3). Two great resources for in-depth information about OAuth 2 are Google’s OAuth 2 documentation and RFC 6749. 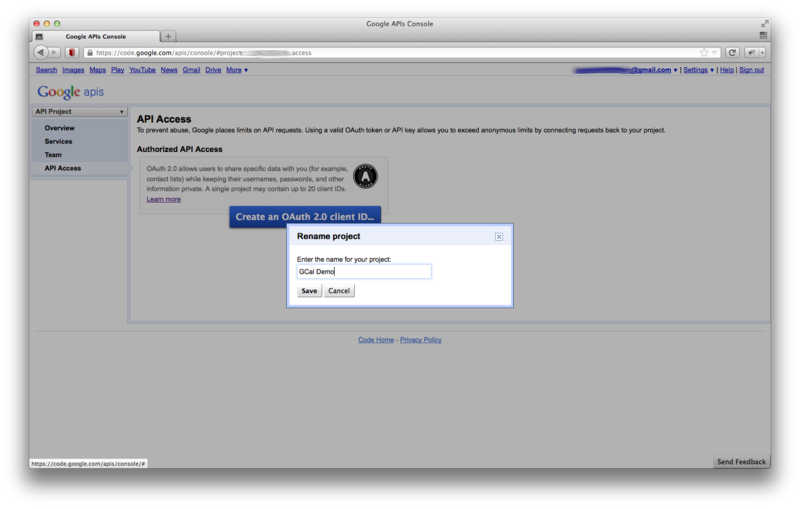 Google’s OAuth 2 documentation describes different scenarios which can be used. I assume that you want to use the Webserver scenario, and specifically that you want to use “online access” (more on that later). 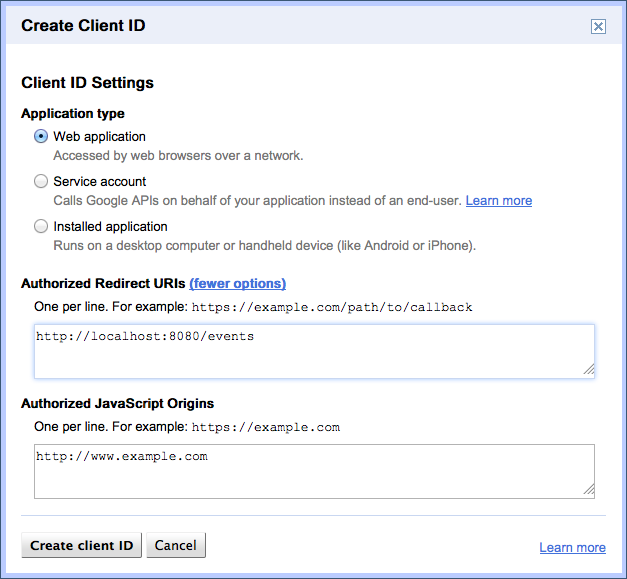 In the Webserver scenario the user is redirected to Google’s authorization server before the first call of the application to the Google Calendar API. After the user has granted access, the authorization server redirects the user to your application along with an access token and the application may access the Google Calendar API with this access token. 2. Create a new client id. 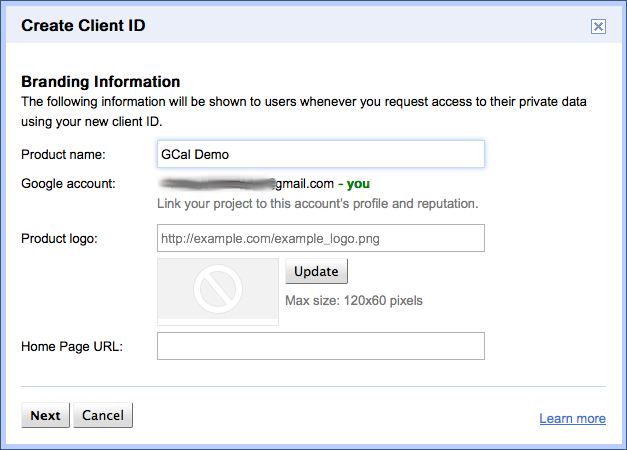 The client id identifies your application against the OAuth provider. Be sure to provide a custom redirect URL in the second screen. The most relevant pieces for your application are the client id and the client secret. As I have already described, the client id uniquely identifies your application with the OAuth 2 provider. The client secret authenticates your application with the OAuth 2 provider. If you want to think of traditional username/password based authentication, the client id loosely corresponds to the username of your application and the client secret corresponds to the password of your application with the OAuth 2 provider. Apparently, these two properties should not be shared. Copy the values for “client id” into the property “google.calendar.client.id” and “client secret” into the property “google.calendar.client.secret” in the file application.properties if you follow along with the demo application. This definition describes the resources we want to access. Apart from the client id and the client secret we have already discussed it also contains the URL to which users will be redirected when the application needs their approval to access their data (user-authorization-uri). The “scope” attribute defines the privileges the application wants to acquire. In this case we want read and write access to calendar data as indicated by the URL. The proper URL can be found in the Google Calendar API documentation. Whenever the application tries to call the Google Calendar API, Spring OAuth 2 will check if the application has a valid access token. This access token is issued by the OAuth 2 provider and provided to the application after the user has granted access to its data. However, the access token is only valid for a limited time period which varies across OAuth providers. Google’s access tokens are currently valid for one hour. After that time period the access token is invalid and users have to grant the application access to their data again. The OAuth 2 RFC specifies a so called refresh token. The refresh token is sent by the OAuth 2 provider along with the first access token. It can be used to obtain a new access token upon expiration of the old one without user intervention. The validity period of the refresh token may be limited and depends on the OAuth provider. Google’s refresh token is valid until the application explicitly prompts the user explicitly for authorization. 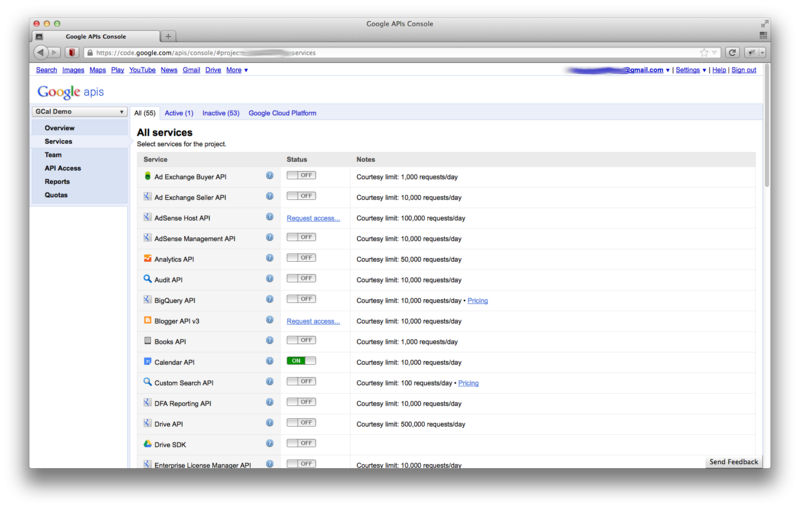 Note that Google sends the refresh token only in the „offline“ scenario. Offline means basically that an application can act on behalf of users without the user needing to be present (think batch processes). For more information on the refresh token please refer to the section on refresh tokens in Google’s OAuth 2 documentation. In the online scenario (user is present when your application accesses the Google Calendar API), Google does not send a refresh token but rather stores a cookie on the client’s browser. This cookie will be used instead of a refresh token to prevent repeated explicit approval from the user. As I have hinted earlier, this scenario applies to the demo application. It adjusts the expiry_in value: The expiry that is sent from the OAuth 2 provider is denoted in seconds from the point in time when the OAuth 2 provider has issued the access token. So, if the access token is valid for one hour, the initial value will be 3600 (60 seconds per minute * 60 minutes per hour). However, this is obviously not suitable for persistent storage. Therefore, the token store will adjust the expiry accordingly when loading an access token. * Custom Exception Mapper provider that integrates the OAuth2ExceptionMapper into the application. Now UserRedirectRequiredException will not be handled by Wicket but propagated further up the call stack which allows the OAuth2ClientContextFilter to handle the exception properly. We are almost done but one last piece is still missing. // application before using it. Although a client library for the Google Calendar API is available it is sometimes feasible to use libraries and technologies that are already used in a project. 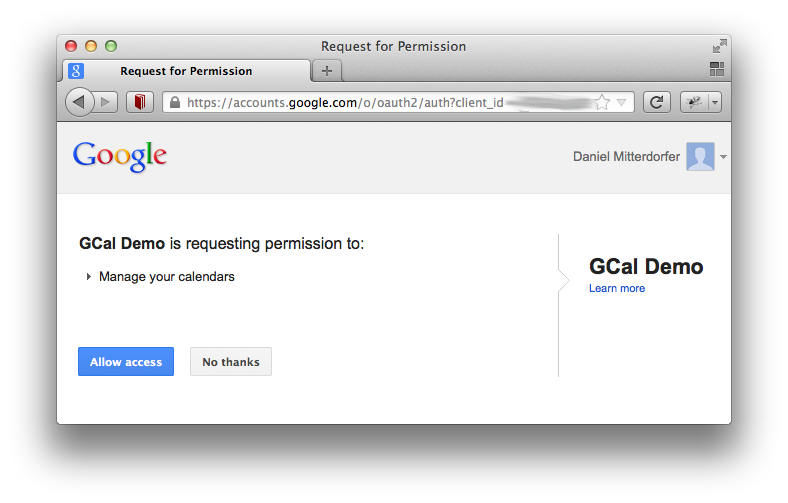 With a few tweaks I was able to use the Google Calendar API in a Wicket application using Spring Security OAuth 2. The example application on Github demonstrates the integration but beware of the limitation that was mentioned above: This setup is primarily suited for single-user applications. If you want to reuse the sample code in a production environment you should use a ClientTokenServices implementation backed by a database and use a real implementation of AbstractAuthenticationProcessingFilter such as UsernamePasswordAuthenticationFilter. I hope that this post described in enough detail how to integrate the Google Calendar API into a Wicket application. Otherwise, feel free to ask questions in the comments section.